In the 21st century, we are inundated with devices. There are devices for playing music, there devices for design purposes and there are even devices that help take care of ones health. But the other theme of the 21st century is minimalism, and this is what brought on the smartphone revolution. There was a time when all phones were used for were to make calls, but now, our daily lives revolve around the smartphone. It combined a lot of features into one handheld product. What if I told you, there is a device which has most of a smartphones features, but rather than being handheld, it is finger held? 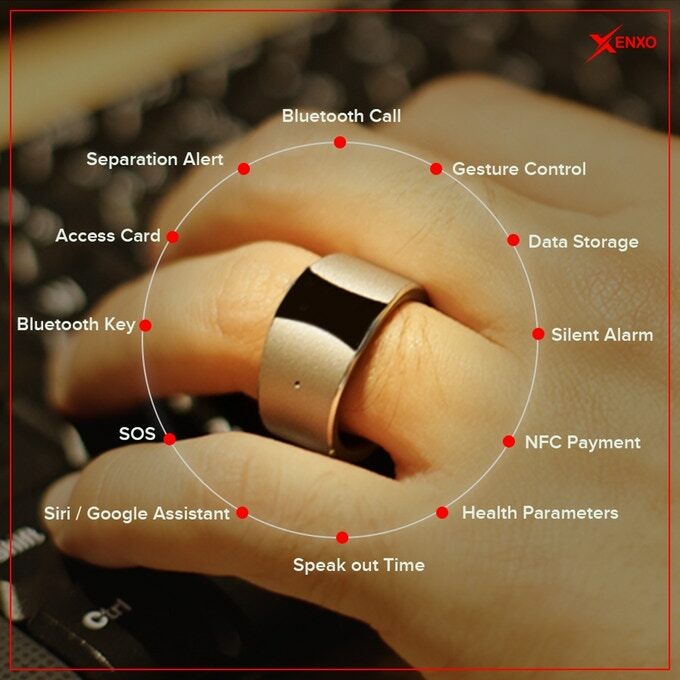 The Xenxo S ring is, literally, a ring, which is equipped with various features. It has a motto of “Carry less, Do more”, which is quite apt. It has a number of features typical to a smartphone, such as Bluetooth calling and data storage. Calls can be attended by clicking a button and placing the ring near the ear. In fact, it is exactly like placing a phone to your ear, except there is no phone in your hand (!! ), just a ring you’re wearing. It also comes equipped with Siri or Google Assistant to make things even more convenient. There is also the gesture control feature which allows you to control your smartphone using the ring and with the help of gestures. For the fitness freaks, the health parameters feature can help you maintain the fitness levels. There are also some features that are not present in smartphones, such as the SOS signal. One click of the button will send an SOS signal out to nearby friends, family and other authorities. The biggest advantage is that the signal can be sent very discreetly. It also has features for those absent minded professors who can’t keep track of their smartphones. The separation alert reminds us if we have forgotten to take our phones along with us. Of course, to access the full range of features, you need to download the xenxo app onto your phone and sync it with the device. The ring has a storage capacity of 4GB and has various sizes. It has a built-in microphone and a battery standby of 5 days. It is compatible with most of the latest versions of popular OS’s such as iOS and Android. With the growing number of devices that exist, maybe it is better we simplify things and make it easier for everyone. A device as small and compact as the S Ring can decrease the consumption of materials for the building of devices, as well as reduce the amount of e-waste. Truly it is a wonderful device, which is useful for us, and doesn’t harm the environment!